If you've been a long time WITK reader, you remember my early days in Colorado. I was a year into my Postdoc and was also working as a fitness instructor. After my move from Colorado to Connecticut, and subsequently to New Jersey, I haven't had the free time necessary to teach classes at the gym. And I miss it so much! I was teaching nine classes a week when I was living in Colorado. Bodystep, bodypump, bodyflow, TurboKick, bootcamp classes, it was all so much fun. I had my regulars in each class and the people I gave a hard time when I didn't see them week after week. We had a party everytime I stepped foot in front of the class, I had a great time making fitness fun with my gym friends. Maybe some day I'll find the time to teach again. It's been a year and a half since I started working here in and I've found my groove with work and the commute and I've started exploring the different gyms in Montclair. And let me tell you, there are a lot of gyms in Montclair! We have a fitness center in our apartment, it's the group fitness experience that I miss. You know I've started taking Crossfit classes (and they are so much fun!). 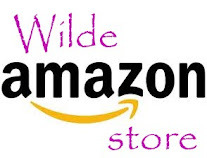 This week I took advantage of an Amazon local deal and got a Barre fitness membership. If you are a former dancer, cheerleader, baton twirler, you should really give bar classes a try. There was totally a former ballerina in the back of the class I took this Saturday. She was making us all look bad! The bar class I took was a cardio and strength class. We lifted weights, used slide boards (which I haven't seen in years! ), did core work and worked our balance. It was great and I felt taller and stronger at the end of class. Plus, it's so fun to work out with a group of ladies and just have fun. I'll be following a fast-paced six-week training program to ramp up my distance to 13.1 miles. It incorporates running along with crosstraining, so I will still have days to hit the Crossfit and Barre gyms. To keep myself on track, I've added a fitness link up there at the top! If you are looking to run a half or just want to workout with me (c'mon, it'll be fun! ), follow along and we'll all be on our way to a healthier summer. With summer (and bikini season) right around the corner, I'm endeavoring to share more healthy recipes. Sure, I'll still be posting plenty of sweet treats and desserts, but I'd like it to be known that I don't really eat that way all the time! Once a week I'll be bringing you one of the lighter dinners from our weekly menu. Healthy foods go hand in hand with my marathon training! Toss chicken breasts with olive oil and sprinkle with salt and pepper. Grill chicken for 8 minutes on each side, or until cooked through. Remove from grill and let sit for 10 minutes before cutting. Bring a large pot of salted water to a boil. Add pasta and cook until al dente, about 10 minutes. While the pasta is cooking and chicken is resting, heat a large pan over medium heat. Add 2 tablespoons olive oil to the pan and let warm for a minute. Add garlic and flour and whisk to combine. Continue whisking and cooking the flour and garlic for 2 minutes. Combine chicken broth and milk in a container, slowly add this mixture to the pan, whisking continuously. Bring sauce to a simmer and let cook for about 2 minutes, until thickened. Add parmesan cheese, salt and pepper and stir until the cheese melts. Add spinach and toss to coat in sauce. 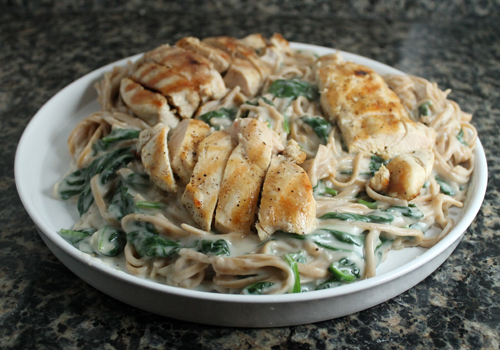 Cook until the spinach wilts down. Drain the pasta and add it to the pan with the sauce, toss to coat. 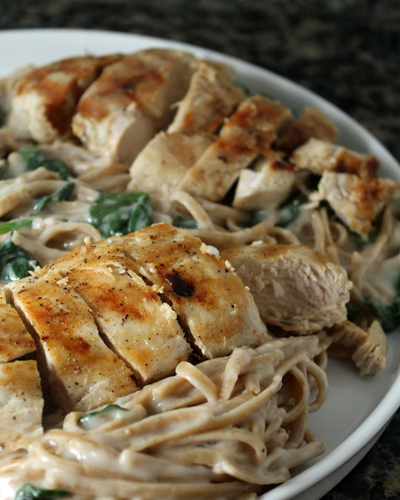 Slice the grilled chicken and serve with the pasta.